A scopa is a part of a bee’s body that is designed to hold and carry pollen. Bees must transport pollen from the flower, where it is collected, to the bee’s nest, where it is deposited to feed the bee’s offspring. 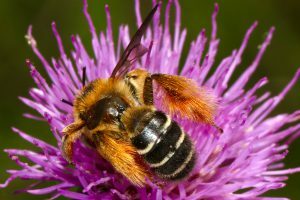 In order to transport large loads of pollen efficiently, and over long distances, bees have evolved specialized structures like the scopa. The scopa is a dense patch of long, branched hairs either on the leg or on the underside of the abdomen. These long, dense hairs are like a thick brush – perfect for holding lots of tiny pollen grains. Sweat bees, long-horned bees, and mining bees are examples of bees with scopae on their legs, while mason bees and leafcutter bees have scopae on the underside of their abdomen. Not all bees have a scopa. One group of bees, the yellow-faced bees, carry their pollen internally. Parasitic bees do not collect their own pollen, but rather steal other bee’s pollen to feed their offspring. Since these parasitic bees do not collect their own pollen, they do not have a scopa. Honey bees and bumble bees have a corbicula or pollen basket instead. A corbicula is a smooth cavity on the hind leg surrounded by a ring of hairs, and it is in this cavity that honey bees and bumble bees pack and store their pollen. Scopae and corbiculae are good examples of the intricate relationship that bees have evolved to efficiently utilize pollen as a food source. As bees consume nothing but pollen and nectar throughout their entire lifespan, they are specialized for its collection and transport. This in turn makes them good at transferring pollen across plants and acting as pollinators. The next time you see a bee foraging on a flower, look for long hairs full of yellow or orange pollen on their legs or underneath their abdomens – this is the scopa! Learn more about the benefits of pollen for honey bees.